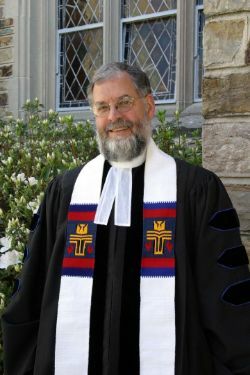 Steve arrived at Idlewild in 2000, having already served churches for twenty years in Appalachia and Atlanta. He earned his B.A. in history from the College of Wooster, an M.Div. from Yale Divinity School, and a D. Min. from Columbia Theological Seminary. He writes, "One of the things I love about ministry is that it touches a wide variety of areas. I have a passion for preaching and worship, and helping to make scriptures come alive through word, water, table, song and prayer. I love being with the very young and the more 'mature' equally. I marvel at the wisdom of both. Much of my ministry is leading an incredibly gifted staff, which continually feeds me. And I know of few churches that combine a strong commitment to the needs of the city and the world, with an equally strong commitment to nurture those who are hurting within our own walls. Howard Thurman once said, 'ask yourself what makes you come alive and do that. Because what the world needs is people who have come alive.' I feel that Idlewild helps us do just that. Steve has been married to Patti, a licensed clinical social worker, for more than 30 years. Their children, A.J. and Sumita, are now young adults. They are both adopted and have enjoyed traveling with Steve and Patti to their birth countries, Peru and Nepal, to find the off-the-beaten-path places. He also finds rest and renewal reading history, biography, theology, and a good novel, especially if it is written by Barbara Kingsolver. Steve can be reached at revsteve@idlewildchurch.org or 901-726-4681 ext. 221.